Requires Android Jelly Bean 4.3 or higher. You can find your device's Android version by going to your device's Settings > About > Android Version menu. Note that different ROMs may host this information differently. The configuration file android.hardware.usb.host.xml should be present on the Android device in the folder /system/etc/permissions. This file enables USB Host Mode on your Android device. Easiest way to check is via USB Host Diagnostics. Any screen size & resolution. Oerad runs on any screen size but it is recommended to use tablets or phones with at least 6" screen for better user experience when viewing radargrams. Ask for our trusted devices. User experience may differ across devices. Not sure what to use? We can ship a 7.0" Lenovo Tab 7 Essential Tablet with your package at preferential prices. Tested and trusted. Some devices do not automatically grant Oerad its necessary permissions. To do so go to Settings > Applications/Apps & Notifications > Oerad > Permissions and check all boxes if not checked. Oerad needs to read & write your external storage to be able to record files; Read phone state to acess USB host abilities. Choose the type of GPR you have and press Next. This can always be changed via the Settings menu - for further information on how to do that read here. Select your preferred measurement unit. This can always be changed at a later stage via the Settings menu. To see how to do that read here. 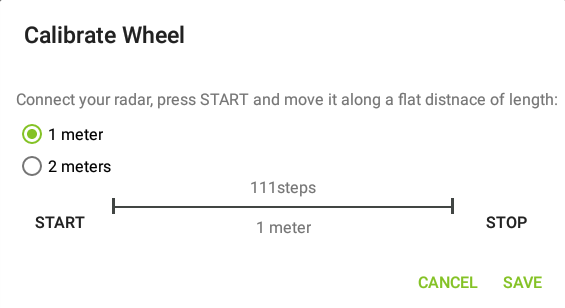 If you have a distance measuring wheel, you can calibrate it here or at a later stage via the Settings menu. For wheel calibration please refer to the wheel calibration section of this user guide. Prepare a 1 or 2 meter long flat surface marking its beginning and end. Make sure no obstructions are present. 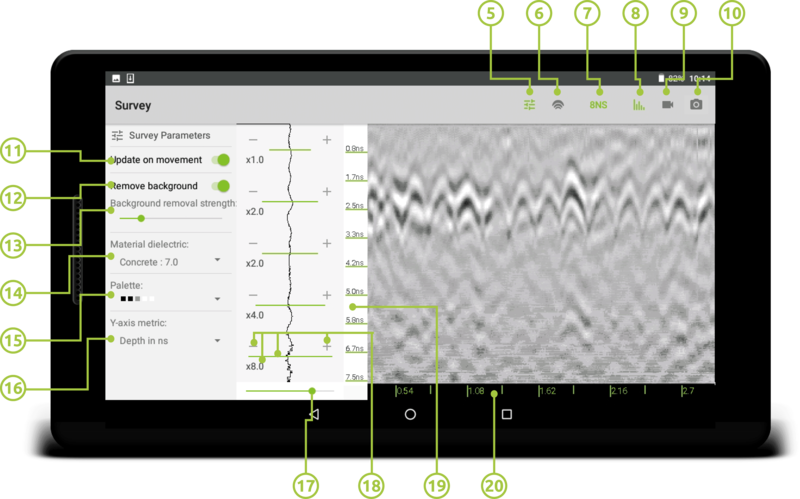 Place GPR at beginning, connect it to your Android device and press the power button on your GPR. Navigate to the Calibration menu in the Oerad app via Settings or on the initial start-up screen (as seen above). Press Start and allow the Oerad App to access the USB device if prompted. Start moving towards the end mark on the flat surface at a slow pace. When you reach it press Stop and then Save. Your distance measuring wheel is now calibrated. Distance measurement works via a step enconder embedded in the wheel. The step indicator in the calibration menu shows how many steps are encoded for troubleshooting purposes. If the value does not change, please disconnect and reconnect your GPR. Main Menu - here you can find shortcuts to basic surveying functionality. Survey Parameters View contains extended options for customizing your survey. This can be hidden to allow more screen real estate for the Radargram view. Wave/Trace view shows the currently received single trace data for reference. Here you can also find the controls for gain filtering - hardware gain and zoned software gain. 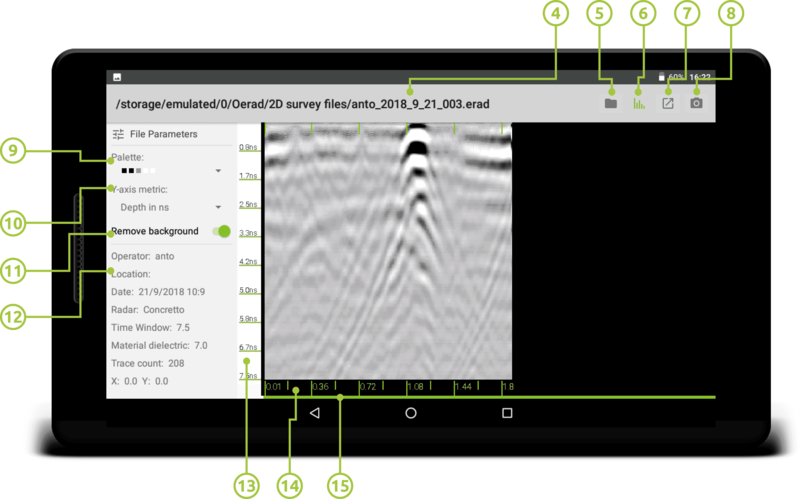 Radargram view visualizes data from your GPR by colour-mapping values. It is continually updated with time (a new line of data (or trace) is shown every 55ms) or when wheel movement is detected. Double tap to Pause/Resume radargram update. Survey Parameters Toggle: Shows/Hides the Survey Parameters View. Time Window Toggle: Toggle between short and long operational time windows. Background Removal Toggle: Apply background removal fitler. Record button: Start recording a file in either the SEG-Y or Erad data formats. Screenshot button: Take a screenshot of the current data on screen. Update on Movement Toggle: Update radargram only on wheel movement - feature not available for Dipolo systems. Background Removal Strength: Manage the strenth of the adaptive background removal filter. It is recommended to have it set higher when moving slower or over great distances. Material Dielectric Selector: Helps penetration depth calculations based on the surveyed material. For more information on depth calculation, read here. Palette Selector: Change palettes to optimize anomaly detection. Depth Switch: Choose penetration depth to be expressed in NS or in meters/feet. Hardware Gain Controll: Five-level signal amplification applied to the whole trace. 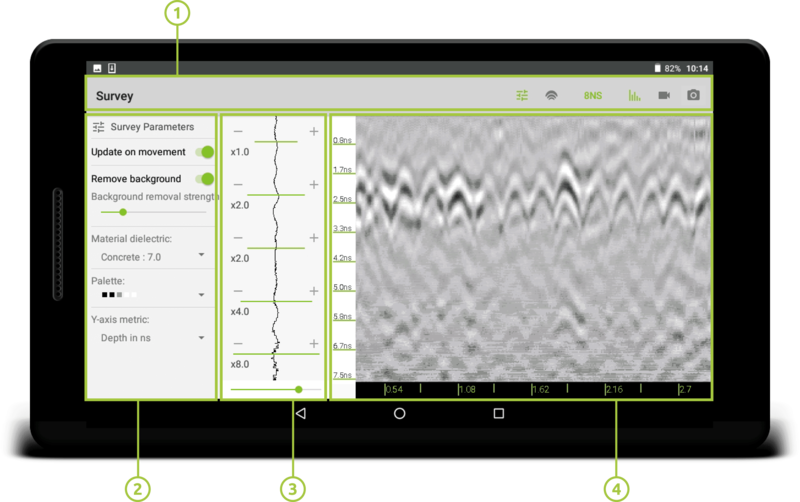 Software Gain Control: Seven-level zoned algorithmical signal amplification. Use +/- controls to amplify/reduce signal strength. Amplification factor is shown for each zone. Depth Bar: Shows trace penetration depth expressed in ns (more accurate) and in meters/feet (based on calculated ideal conditions). For more information on depth calculation, you can read here. Distance Bar: Shows travelled distance from point of enabling update on movement. Feature not available for Dipolo systems yet. Main Menu - here you can find shortcuts to basic surveying functionality and the full file name. File Parameters View contains several options for viewing your file and displays information about the file. 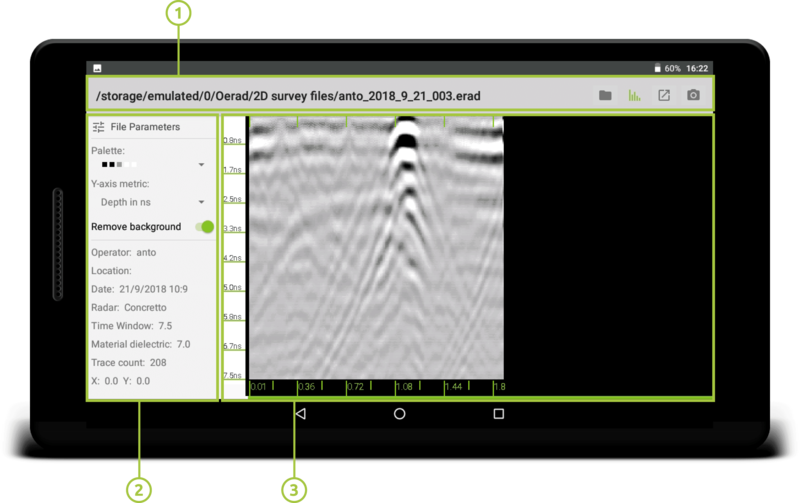 Radargram view visualizes data from your GPR by colour-mapping values. When entire file does not fit on screen, tap on screen in swipe left/right to navigate file. File Name: Displays file name and location within local file system. Open File: Open a different file - will show a file-tree menu to navigate to your desired file. Background Removal Toggle: Apply adaptive background removal based on the whole of the file. Export File: Export currently opened file to SEG-Y. More file formats coming soon. Screenshot Button: Take a screenshot of the currently visible part of the file on screen. FIle Information: Information about the survey conditions while recording. Distance Bar: Shows travelled distance from start of recording. Feature not available for files recorded with Dipolo systems yet. Location in File Bar: Shows the current location within the opened file. My radar: If you switch between GPRs or WPRs you can set your Oerad App to the device you'll be working with. This is important to get accurate distance and time measurements. Measurement system: Switch between metric and imperial. Manage material dielectrics If the materials you'll be surveying are not listed in the preset material and dielectric lists, you can add custom values here. Save a SEG-Y copy when recording: If you'll be using SEG-Y files primarily this is a handy option to save files in SEG-Y as you record them. 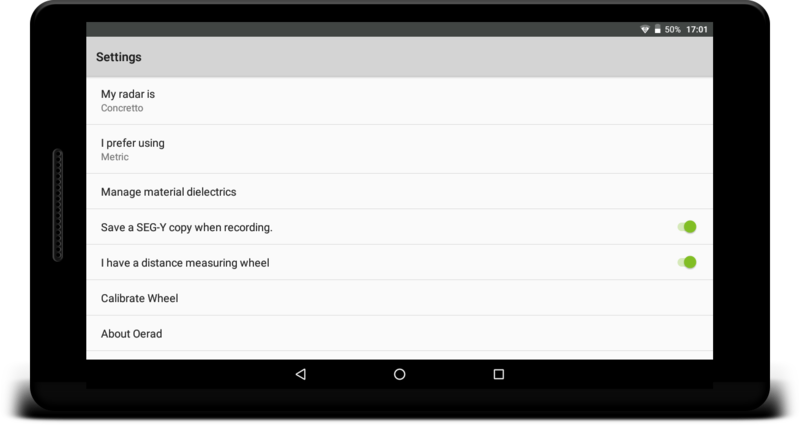 I have a distance measuring wheel: Check this if you want the Oerad App to recognise data from your distance measuring wheels. You need to calibrate it at least once. Calibrate distance measuring wheel: If you have a distance measuring wheel you need to calibrate it at least once to work. To do so please refer to the here. About Oerad: Learn a bit more about the Oerad app and Oerad Ltd.